Darth Maul #3 is actually a pretty good issue. Maul and the bounty hunters get into some trouble as they figure out a way to steal the Jedi padawan without paying a fortune they don’t have. However, the gangster queen Xev Xrexus is pretty smart too and manages to one up the bad guys. But who do you root for when both sides are bad? The issue opens where the last one left off. The Jedi padawan speaks some sass to Darth Maul while the Sith just broods and strikes her force field with his pent up anger. But Maul doesn’t have a plan on how to get the Jedi out of her jail cell and Xev Xrexus catches him before he can. She lets him go, and Maul goes for plan B, engaging his bounty hunters to come up with a plan. They wait for the auction to proceed and bet on who the winner will be. Their guess is correct and they ambush the winner on their ship, taking control and taking possession of the Jedi padawan. But Xev keeps one step ahead of them and disables their ship, causing them to crash land on the nearby moon. Xev then announces to the failed bidders that bids are now open on a hunt for the Jedi. Storywise, this issue strikes well in some areas and fails in others. Cullen Bunn does a great job with the banter between the bounty hunters. Bane in particular stands out with his trademark personality. Bunn also does a great job with Xev Xrexus as the way her character outsmarts Maul and the bounty hunters is very fitting with her being an intelligent crime boss. She not only stops them from getting away with the prize but turns them into a second source for monetary reward. The drawback in the issue is Maul. His character remains shallow, shortsighted and not really likeable. There’s nothing to relate to and no depth. He just wants to kill a Jedi. I was kind of hoping there might be a bit more to the story than that in regards to Maul. Artwise, Luke Ross continues to do a great job with the panels. There’s some excellent artwork and some nice colors by Nolan Woodward. It brings the story to life with plenty of detail, some good likenesses, and some fun elements in the background. While Maul is a little disappointing, the rest of the comic does a great job. Enough so that I can overlook Darth Maul and enjoy the rest of the story and the characters. 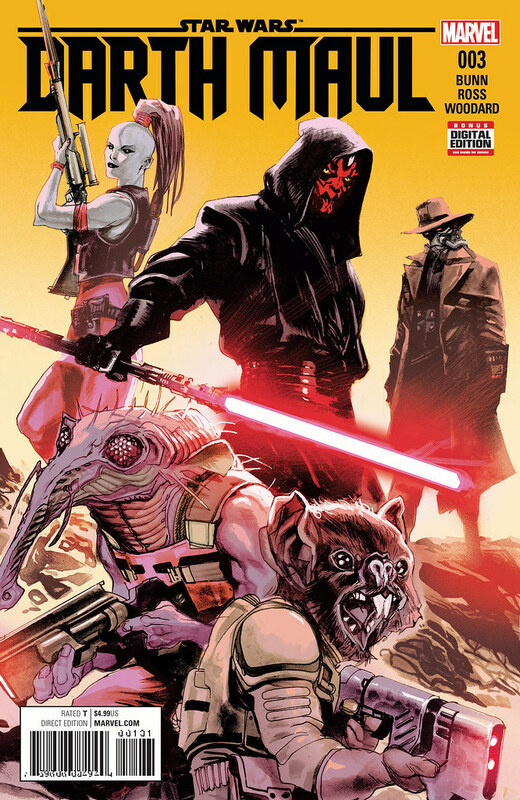 I give Darth Maul #3 and five out of five metal bikinis and look forward to where the hunt will lead the story.